Music is a very influential tool in the educational environment. 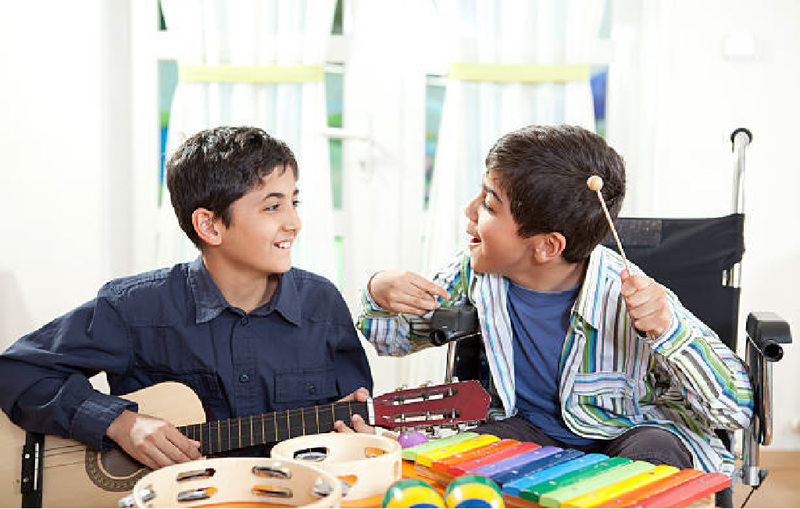 Learning how to play an instrument can improve fine motor skills and coordination, singing songs from the radio or music books can improve language and memory in early childhood students, and dancing to music can be a form of exercise for students who may not be involved in other extracurricular activities. When a student is encouraged to participate, music can increase their own self-confidence, while giving them the feeling of being connected to their classmates. So how can an educator use music as a teaching tool in a Special Education environment, or along with general education students? First, involve every student! A student who does not participate cannot make any progress, so include everyone, even if it is only for a short period of time. Second, have a buddy system to help with transitions that are unfamiliar to the student. When a child has a friend, it can make the change easier. Also, be aware of sensory issues of each student. Offer headphones or ear protection since some special education students can get over-stimulated from the abundance of sounds and activity. Have replacements ready for movement or instrument props for students who may not respond well to the ones being used. Finally, keep the concepts simple and promote themes or skills that relate to everyday life. Holiday themes and songs are happy and fun, so the student will be more comfortable joining! Start each class with a “Hello Song” to greet the students with a familiar tune. Sing-alongs can incorporate movement into music for the inclusion of non-verbal students. Always consider adapting the movements for students’ specific needs. Song suggestions, as appropriate, are a good way to include students’ individual taste in music. Watching the video on YouTube can stimulate their memory recall, and if there is a dance associated with it, the students can dance freely to encourage creativity. Instrument practice allows students an opportunity to play an instrument that is tactile and precise. Based on the students’ motor abilities, some instruments may be easier than others. For example, holding and striking a triangle may be more difficult than playing a tambourine. A Goodbye Song wraps up the session and sends the students out with a positive parting experience. Music Together – This website offers a music curriculum, as well as parent resources and a store to purchase singalong storybooks. To view more information about the curriculum, click https://www.musictogether.com/schools/our-curriculum. Super Simple Songs - YouTube Channel (https://www.youtube.com/user/SuperSimpleSongs) - Sing and dance along to kids’ songs and nursery rhymes. We would also like to thank Kelsey Lohman, of Highland CUSD 5, for her suggestions on how to establish a great music program in an inclusive classroom!